Cultivators and wholesalers involved in rice, fruit, and vegetable manufacturing in the Echigo Plain collaborate in the unique manufacture of rice. The Origins of “Shirokuma Rice” Our select methods of rice cultivation trace their origins to 1890. 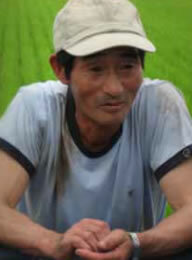 Shirokuma Co., Ltd. founder Kumakichi Shirane consulted with local producers about fertilizers and pesticides as he collected rice. Situated in the center of the Echigo Plain, the area was not only one of Niigata Prefecture’s prominent rice production areas. The land was also suited for bountiful harvests of fragrant and sweet pears, peaches, grapes, and other fruits, as well as vegetables such as tomatoes, eggplants, and onions. Association members include cultivators in the five municipalities of Sanjo City, Tsubame City, Kamo City, Tagami-machi, and Niigata City who cultivate rice, fruit, and vegetables, shipping the products to Shirokuma Co., Ltd.. The Association researches how to create rice that is “safe”, that “reassures”, and that has “superior flavor.” Their research covers a wide variety of aspects ranging from the improvement of cultivation technologies to management and distribution methods. This research is then utilized in rice cultivation. Every bit of care and concern I extend is linked to the “safety and superior flavor” of my rice. “Everyone, from children to the elderly eats this, so it is only natural that one would take the time to do it right.” I’m not the only person that thinks this way. All the members of the association cultivate their rice with the same line of thinking. As we cultivate our rice with low levels of pesticides, we have to be more cautious about agricultural pests. However, when I consider the fact that this care and concern is linked to “safety and superior flavor,” I know I can keep doing my best. I hope to continue to provide dinner tables with good quality rice.